Androlic 50 mg tablets is an oral anabolic steroid, one of the well-acting drugs, the active ingredient in the composition of this steroid is oxymetholone. 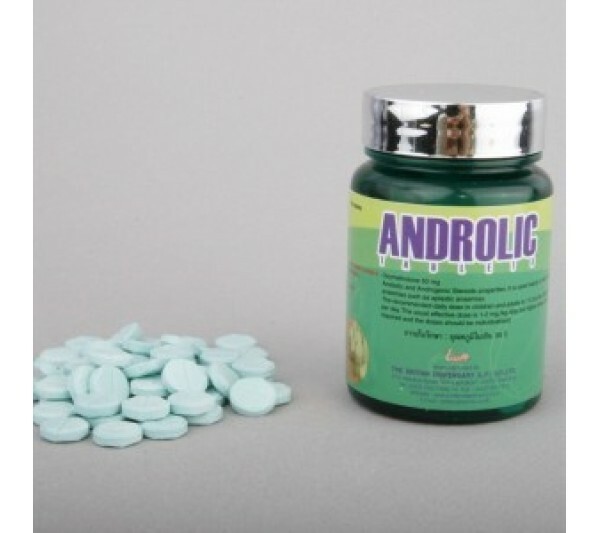 Taking Androlic in two weeks you get a set in a mass of 5-7 kg, it has a strong anabolic and androgenic effect. Steroid makes a big water retention, is not suitable for the reception before the competition. But many bodybuilders do accept it even before competitions. Taking Androlic 50 in combination with diuretics and antiestrogens to remove excess water from the body, and the week before the competition stop taking it. As for the dosage, the manufacturer writes in the instructions that you need to take 1-5mg of the drug per 1 kg of body weight, in fact, this dose is large, if so taken, then many side effects appear. For beginners, the normal dose is 50 mg per day (maximum), the dosage should be increased gradually. The maximum time for taking the drug Androlic should not exceed 8 weeks, after which you need to take a break. A good combination of taking Sustanon, Parabolin and Androlik, with this combination, the athlete gets very good results. For newbies, Androlic is not recommended to use, as this drug is very powerful, it is better for them to start with light steroid preparations, reach a certain level and even then switch to strong steroids. For women, it is not recommended to take this steroid (Androlik) because of its high androgenic effect, but many women do not pay attention to it and accept, then it is better for them to reduce the dose of steroid. Of the benefits it has a high androgenic effect, when combined with other drugs gives very good results. Of the minuses, buy Androlic 50 mg/tab makes water retention and is not used before competitions, since athletes do not need large amounts of water in the body, on the contrary, they get rid of it. It is necessary to stop taking this steroid and you get a big loss in weight up to 5 kg, and also the strength will fall by about 10 kg. In order to make the losses minimal, athletes combine this steroid with other similar steroids, or, after completing the course, switch to injection testosterone. It is not recommended for elderly athletes to take, as the risk of getting side effects on the liver and prostate increases. There is a decrease in the level of hemoglobin in the body, you need to monitor this test and take hemoglobin-boosting drugs. As for side effects, I refer to them the complications that started with my heart. After training, shortness of breath appeared, which lasted for about an hour, and sometimes the impression was created by the lack of air - I could not breathe deeply. I associate all this not so much with an increase in body mass, for me it was insignificant as with the volume of muscle mass in general, chest muscles, in particular. And the ability to increase burdens and, most importantly, the desire to do this, led to overtraining of the body, and most importantly, gave an excessive load on the heart, which does not have the proper level of preparation for such shocks.